Osage County Attorney Brandon Jones, left, shows a picture of Dorothy Wight, Burlingame, during opening statements Monday in Lyndon. Wight and three relatives were shot in her home in 2009. LYNDON—Key witnesses for the prosecution in the capital murder trial of James Kraig Kahler spent Monday in court, one recounting how he witnessed his father shoot his mother, and another explaining how he tried to comfort a dying 16-year-old. Sean Kahler, 12, testified Monday in Osage County District Court during his father’s capital murder trial, that as he stood at the kitchen sink of his great grandmother’s Burlingame home, alongside his mother, his father came in “with an AK-47 or something similar,” and shot his mom in the leg. Before running to a neighbor’s home to call for help, Sean escaped unharmed but heard several more gunshots inside the house. 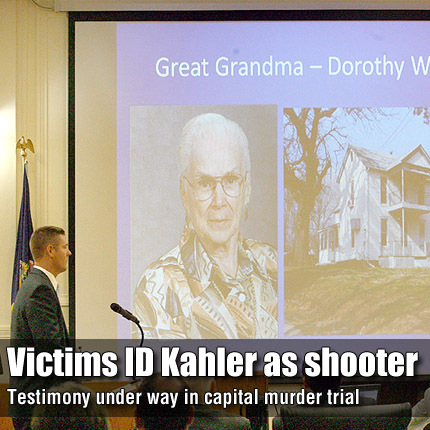 The boy’s appearance in court marked the first time Kraig Kahler had seen his son in person, since the night of Nov. 28, 2009, the night Kahler allegedly fatally shot his estranged wife, Karen Kahler, 44, his daughters, Emily, 18, and Lauren, 16, and Karen’s grandmother, Dorothy Wight, 89. “Not really,” he said, with a noticeable break in his voice. He now lives with his mother’s sister, Lynn Denton, and her husband, Tim, and their sons in Derby.